Look in your newspaper this Saturday, and you may see a paragraph about Saturn’s moon Titan and a giant storm that moved across the surface last May and what that means. With luck they’ll even print it with a tiny little picture of Titan to catch your eye. Your response, if you have one, will likely be “huh.” It’s OK. I’m not offended. It’s hard to distill the richness of a full scientific paper into a paragraph. And it’s even harder, still, to distill the richness of a decade of scientific inquiry into a short scientific paper. But if you’re curious about what that little paragraph means, and how it came to be in your newspaper, and what we’ve been doing for the past decade, read on. It’s a long story, but that’s somewhat of the point. I became interested in Titan ten years ago, almost as a matter of convenience. It was an excellent solar system target for the then-new technique of Adaptive Optics, which attempts to undo some of the effects of the smearing of starlight caused by Earth’s atmosphere. Titan was a great target because it is just small enough to be completely smeared by the atmosphere, but big enough that, if you could unsmear it, you would still have a nice view. Just as importantly, no one had ever had a nice view of the surface of Titan before because the satellite it covered in a thick layer of smog which mostly doesn’t let light penetrate to the surface. When the Voyager spacecrafts flew by, they took pictures of Titan which look like a big orange billiard ball. I should have said, though, that visible light doesn’t penetrate to the surface. On the earth, red light penetrates smog better than blue light (hence the nice red sunsets on a smoggy day in Los Angeles). The same happens on Titan. Red penetrates better than blue, but infrared penetrates better still. In fact, if you go far enough into the infrared, you can take a picture of Titan and almost not notice any smog there at all. Conveniently, the new technique of Adaptive Optics works best in the infrared. Hence Titan became a natural target to try out the new techniques on. Antonin Bouchez, then a relatively new graduate student at Caltech, signed on to do this project as part of his Ph.D. thesis. Our first goals were to obtain maps of the then-almost-totally-unknown surface of Titan. And what a strange looking surface it turned out to be! We speculated endlessly about what all of those dark and bright spots on the surface might be (for the most part it is fair to say that we – and everyone else – had no idea whatsoever until we got better images from Cassini a few years later). And then, in late 2001, we found a cloud sitting at the south pole of Titan. It doesn’t sound like such a big deal, except that it had long been predicted that Titan was incapable of having clouds. Occasionally there was speculation that clouds of methane might be present, but that, if so, they would be tightly confined to the equator. And yet there it indisputably was: a cloud at the south pole. It worked. Just a month after our first cloud detection Sarah saw something that looked just like what we expected a cloud to look like. We called people at the Keck telescope and begged them to snap a picture, and there it was. A much bigger splotch, still near the south pole. I’m an astronomer, not a meteorologist. I had to spend six months learning about how clouds worked, trying to understand precisely why people thought they wouldn’t occur on Titan, and figuring out what was wrong. On a long summertime flight across the country where we continuously skirted afternoon thunderstorms, it all came together: no one had ever previously bothered to consider the effect of Titan’s surface heating. Like Arizona on a summer afternoon, Titan’s surface can heat up and eventually drive convective clouds over it. On Titan, though, it doesn’t happen in the afternoon. It happens in the summertime, when the south pole spends something like 10 years in continuous sunlight. It was a compelling story, and, I think true. But, even better, it made some fairly clear predictions. The clouds were at the south pole when we discovered them only because it was very close to southern summer solstice. Titan (and Saturn) takes 30 years to go around the sun, so its seasons are quite long. But if you had the patience to watch, you should see the clouds move from the south pole to the north pole over the next 15 years before coming back 15 years later. Antonin eventually got his Ph.D. and moved on to take a job working with the technical team continuing the development of Adaptive Optics at the Keck Observatory. It was the perfect place to be. Whenever there was a spare moment or two at the telescope, he would swing it over towards Titan and snap a picture. The clouds were nonstop. Sometimes there were just a few tiny specks, but occasionally there would be a huge outburst. It was a thrilling show to watch. Emily Schaller entered graduate school at Caltech at just about that time, and she decided to do her thesis on watching and understanding these developing clouds on Titan. The first year was exciting, indeed. She saw a monster cloud system cover the south pole of Titan and remain for more than a month (disappearing just as one of the first close Cassini flybys went in to take pictures; Cassini saw a few wispy little clouds but missed almost all of the action). 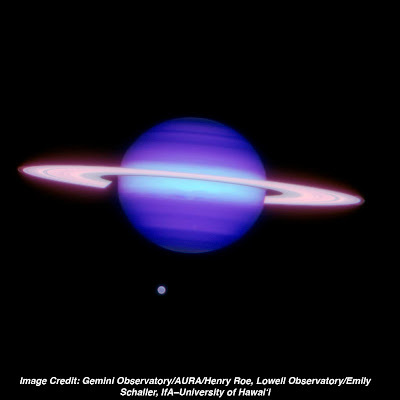 Henry Roe, a recently graduated Ph.D. from the University of California at Berkeley who had been using the Adaptive Optics on the Gemini telescope to study Titan, moved down to Caltech to work with us, and the odd discoveries about the clouds poured in. They appeared to finally move north from the pole; they appeared tied to one spot at 40 degrees south latitude for a while; they untied themselves; bright clouds in one spot seemed to foretell bright clouds in another. It was clear that we were amateurs here. We enlisted the help of Tapio Schneider, a professor of environmental engineering at Caltech and one of the world’s experts on atmospheric circulations, to help us make sense of what was going on. Things were finally falling into place. In one final piece of exceedingly clever astronomy, Emily Schaller replaced our clunky nightly observations with a 14-inch Celestron, originally begun by Sarah Horst, with a sleek set of nightly observations from NASA’s Infrared Telescope Facility on top of Mauna Kea. The IRTF would take a quick spectrum of Titan every night possible, and Emily could quickly look at the rainbow of infrared light to tell precisely how many clouds were there. And when they looked good, she could tell Henry Roe, who would get the Gemini telescope to examine them. And then the clouds stopped. For years and years Emily would look at her data in the morning and walk across the hall to my office to mournfully say “no clouds again last night.” Seeing no clouds is scientifically interesting, and she dutifully wrote papers and indeed an entire chapter of her Ph.D. thesis demonstrating and trying to explain this years-long lack of clouds. But, really, I understood. Explaining a lack of something is not nearly as satisfying as actually getting to see something happen. As her advisor, I would have been happy to fly to Titan to perform a little cloud-seeding, but no one had yet figured out exactly what chemicals or incantations might do the trick. On April 14th last year, Emily walked across the Caltech campus to finally turn in her thesis. Then she did what she did most mornings: she walked to her office, downloaded the data from the night before, and checked to see if Titan had clouds. That morning, I suspect, she came close to falling out of her chair. She was likely exhausted from those final stretches of thesis writing, and I am sure that the first time she plotted her data she did what I always do when I see something astounding: she assumed she had made a mistake. She probably re-downloaded the data, double-checked the coordinates, and shook herself a little more awake. But it was no mistake. Titan suddenly had the largest cloud system seen in years. She likes to say it was Titan throwing a graduation party for her. But I know better: I think Titan likes to hide its secrets as long as possible, and knew it was finally safe to let go. The scientific paper that Emily wrote along with Henry, Tapio, and I that appears in Nature describes the big cloud outburst and its scientific implications. And the implications are pretty fascinating. This big cloud outburst – the biggest ever seen – began in the tropics of Titan, where it has been speculated that clouds, if they ever form, should be weak wispy things. The tropics are where, of course, the Huygens spacecraft that landed on Titan took dramatic images of things that look like stream beds and shorelines and carved channels. How could those be at the equator if there are never clouds and never rain? People asked. This discovery doesn’t actually answer that question, because we don’t know why there was a huge outburst of clouds in the tropics of Titan. But it does perhaps answer that lingering question: How could those be at the equator if there is never rain? Because there is rain. Now, however, I am going to allow myself to speculate a bit more than we were comfortable speculating in the scientific paper. I am going to ask: Why? Why were there clouds in the tropics? Why did they appear suddenly at one spot? What is going on? What I think is going on (again, I warn you, rampant speculation follows…) is that Titan occasionally burps methane, and I think Emily found one of the burps. For many years scientists have wondered where all of the methane in Titan’s atmosphere comes from, and, I think, here is the answer. The surface occasionally releases methane. Call it what you want. Methane geysers? Cryovolcanoe? Titanian cows? Whatever happens, the methane gets injected into the atmosphere and, at that location, instantly forms a huge methane cloud. Massive rainout ensues downwind. The stream channels, the shorelines, and everything else in the otherwise desert-seeming regions are carved in massive storms. Evidence? Evidence? Where’s the evidence? You scream. Fair enough. I am giving you a snapshot of how science is done, and, at this point, this is the hypothesis stage. Or hunch. Or speculation. This hunch is the type that then guides what we go off to try to observe next. What will we see? Will the spot Emily found burp again? That would be pretty striking confirmation. Will other spots blow? (I should mention that we do indeed think we saw a different spot burp a few years ago). At this point we have observed Titan well for about 7 years, from the winter southern solstice until the northern spring equinox, which actually just occurred last week, the terrestrial equivalent of late December to late March. What will the rest of the year reveal? We’re still watching, waiting. Maybe in 23 years, when we’ve finally seen an entire season, we’ll call it a day. Me: still a professor at Caltech, though I moved from untenured assistant professor at the beginning to Richard and Barbara Roseberg Professor of Planetary Astronomy at the end. My goal in life is to never leave this fabulous job. Antonin Bouchez: Loved adaptive optics so much that he came back to work full time on the adaptive optics program at Caltech's Palomar Observatory. Sarah Horst: Went to the University of Arizona to pursue a Ph.D. in planetary science. Getting her Ph.D. this year with a thesis on.... you guessed it... Titan. Emily Schaller: Got her Ph.D. last year and is now a Hubble Postdoctoral Fellow at the University of Arizona, still studying Titan but expanding her horizons. Henry Roe: Catapulted from Caltech to be a staff astronomer at Lowell Observatory in Flagstaff (where Pluto was found, of course). Hopes to stay forever, I believe. Tapio Schneider: Also an assistant professor at Caltech at the time, quickly rocketed to full professor. Titan: still in orbit around Saturn. Wishing it could break free, since, given that it is bigger than Mercury, it might count as its own planet. "southern summer equinox"? I think you meant "solstice". I made the same error just yesterday in a spherical geometry lesson about hours of daylight. So much info here. I love reading stuff about astrology. Keep it up. "Titan: still in orbit around Saturn. Wishing it could break free, since, given that it is bigger than Mercury, it might count as its own planet." Except that it would first have to "dominate its neighborhood". This gives me a surreal vision of several round moons rebelling and banding together to dislodge Saturn from its place. Because, after all, Jupiter is too big to budge. It reads like something out of Greco-Roman mythology. P.S. Thanks for the update on Titan. Truly a fascinating world. I wish Huygens was still alive. I had a strange dream about Titan many years ago. I was director of the Huygens mission and the ship plopped down into a liquid to the accompaniment of great cheers from the staff in the control room. Presently, a huge monster rose from the deep and swallowed the ship. A sad groan erupted from the assembled technicians. But I looked down and we were still getting a signal! The creature was transparent to radio waves! "Where is the best possible place on this planet we could have this probe?" Fantastic article but you guys have no sense of chivalry. How can you let the woman sit on the friggen roof all night?? can your Titanean spectroscopy differentiate the C-H and C-D bonds in methane? If Titan's atmosphere is photodissociating and preferentially losing the light H isotope over time, you would expect burps from the interior to have a higher H/D ratio than the rest of the atmosphere. Fascinating story! I've always been interested in Titan, especially the history of the people who discovered it. Has there been any evidence of lighting in these clouds? As far as I know, lightning only occurs on Earth, Venus, Jupiter and Saturn. Clive: We paid her! Ah but there is a funny story. Too bad Sarah would kill me if I told it. Chuck: It's a great idea, but we've got the wrong equipment. You need higher resolution and longer wavelength. So we're not sensitive. Daniel: No evidence of lightning to date. There are many many many Cassini images of the back side of Titan, but, honestly, I do not know if anyone has looked very hard. It'd be a tough project. But. Hmmmmmmmmm. Cool story, would a methane "burp" vibrations be detectable? I don't suppose the Huygens probe had a seismometer/seismograph? Keith_S: Not impossible that something would be seismically detectable. Sadly, Huygens only lasted a few hours! Since there's so much rampant speculation in this article, I was wondering if you can apply it to what led to the cloudless days on Titan. Was it the possible absence of methane "burps"? Could it have been a result of the seasonal changes, as the Southern hemisphere wasn't heated by the sun as much anymore? Nicely written.. science with a personal touch :).. brilliant..
Amazing article, indeed. Makes me want to take part in this kind of research as soon as possible. Well, more than usual, at least. I'm currently an Astrophysics undergraduate student. I was reading the comments about Sarah's job and thinking: "wow, studying in Caltech, looking every night through a 14" telescope to Titan, under a starry sky, and helping to reveal the mysteries of that moon along with professional astronomers… I'd do that, too…"
Articles like this are really inspiring, especially for people who aspire like me to do for a living what you describe here. Thanks for that. I really mean it. Great post -- it's always fun to read the personal side of science that isn't captured in the article in Nature. I'm liking the space cows idea myself : ) Didn't the story make its way around Twitterverse on your birthday? In other news, the short summer session is over and I passed Astronomy and Biology. I haven't gotten my grade back but it's mathematically impossible to have made less than a C. In fact I was in pretty good position to ace Solar System Astronomy. I had to work really hard at Biology. Frankly I was kind of appalled at how far I'd fallen behind there. Looking at the nitrogenous rings of the DNA molecules sort of reminded me of military explosives like RDX. I learned ATP is actually a rather crummy fuel, the body just makes a lot of it. I found out what happened to my buddy Larry Henson (cystic fibrosis). And me (insulin). But I didn't find out what happened at Titan. I'm kind of intrigued by the 10000 Dalton negative ions in Titan's stratosphere. Manna from heaven? Or smelly old smog? Seems hard to do without polar solvents. Let's see...to get from diacetylene to methane needs hydrogen. From...water? Some sort of oily Krebs cycle? That might be as likely as volcanos that follow the seasons from pole to pole across the equator. Either a geological mystery or a biological one. No evidence of lightning to date. There are many many many Cassini images of the back side of Titan, but, honestly, I do not know if anyone has looked very hard. It'd be a tough project. Could you use a Galaxy Zoo type of approach? Of course, organising that is a big project, too. But the implication that chemical processes may play a role in energy transfer involving the troposphere sends me for a loop! Do we know what Titan looks like in the submillimeter? Sounds like a job for the GBT! Totally OFF TOPIC - but I've just got to let you know Mike that I am hijacking Haumea, Eris, etc, as titles for my new orchestra piece, The Plutoids, in recognition of IYA2009. And it has been a lot of fun! I think its awesome that we now have technology to actually image features on an astronomical target as tiny as Titan! Late to the party- as always. Mike (and others)- I'm pretty sure they've been looking for lightening and haven't had any luck. There are apparently at least a few reasons why there probably won't be any. P.S. Mike I would kill you if you told that story, but mostly because you always tell it wrong. Really it isn't worth all the fuss. Mike just likes to tease me, a lot. One night he came up to see how things were going and my friend Mike (a different Mike) was with me in the dome. He likes to tell the story like I was having some kind of romantic date in the dome but really it was completely innocent. My friends used to come with me occasionally because they thought it was cool. Today there will be isolated explosions.. chance of methane rain. If you have to go out bring your cryo-umbrella, and don't forget to wear your space suit! Next week, and for several years after, there's no chance of weather at all. Don't forget to wear your space suit! I like the topics about planets, they are very interesting...this post called The long road to a Titan storm , is very interesting, thanks for sharing! The topic of planets and space has interested me since childhood. Very interesting post, thank you! It is amazing that we now have technology to actually image features on an astronomical target as tiny as Titan! great titan picture. It looks like a 3d digital picture not a real picture ! Planetary science is a fascinating subject. But what is even more interesting is the prospect that some terrestrial worlds other than our own, have weather. I do not count the "storms" of the gas giants as true weather, those storms are just part of the planet's composition and related mostly to the planet's rotation and/or jet streams. Terrestrial worlds/planets that may experience true weather (other than Earth) are few and far in between in our Solar system including Venus, Mars and Titan. Other than Earth, the only Solar System world with a possible hydrology cycle, is Titan. Perhaps one day, such large (planet sized) moons will be re-classified as planet orbiting planets (POP); only time can tell. Great picture of Titan, if you have anything in higher resolution pls post more. The modern world is so awesome. Hope I could have a chance to get there.